What Makes A Good Hearing Assessment? Home » Blog » Uncategorized » What Makes A Good Hearing Assessment? It may seem like all audiologists are equal. After all, you can either hear well or you can’t, right? But the truth is, there is sea of difference separating the various services on offer. Surprisingly, not all audiologists offer you the full set of comprehensive set of tests that will ensure you are correctly fitted with the right hearing aid. Ensuring you choose an audiologist that offers the most comprehensives tests possible is the best way to find the right device for you. The various tests that your audiologist performs are the foundations upon which your hearing aid treatment will be built upon. It is important to note that a “Hearing Aid Assessment” and a “Hearing Test” are not necessarily the same. In fact, only a Hearing Aid Assessment can provide you with a comprehensive solution to your hearing loss. A standard Hearing Test will measure your sensitivity to sound as well as the physical health of your ears. This is something that every audiologist can provide. If there are any physical or medical problems, the audiologist will send you to a general practitioner or ear specialist for further evaluation. Whereby your Hearing Test is deemed complete. What happens next is where a good Hearing Aid Assessment differs from a standard Hearing Test. During a Hearing Aid Assessment your audiologist should still assess your sensitivity to sound and your ears’ physical health, but they will also perform one more very important test, a ‘Speech In Noise’ test. What this means is, your ability to hear speech while there is background noise present will be verified. This test is essential to calculate how successful you may be with a hearing aid as well as the level of technology you may require. Furthermore, when you consider that poor hearing clarity in background noise is the number one complaint of those with a hearing loss, performing this extra testing ensures each patient is getting the right advice the first time. When you look at these two options side by side, it is easy to understand why so many choose a Hearing Aid Assessment. A standard Hearing Test to ascertain hearing loss is OK, as it does provide a certain level of information. But if does not give the full picture, and when it comes to hearing, you need accuracy. Here is a great example: Two patients register the exact same sensitivity to sound, however, they differ significantly when it comes to their speech-in-noise scores. When treated by an audiologist who performs a Hearing Aid Assessment, these patients will receive different treatment even though they have the same level of hearing loss. However, if they were assessed with only a standard Hearing Test, they could have ended up undergoing the same treatment that may not have been optimum for one, or both, of them! We believe that this level of service and commitment to our customers is what sets Focus Hearing apart from other audiology clinics. 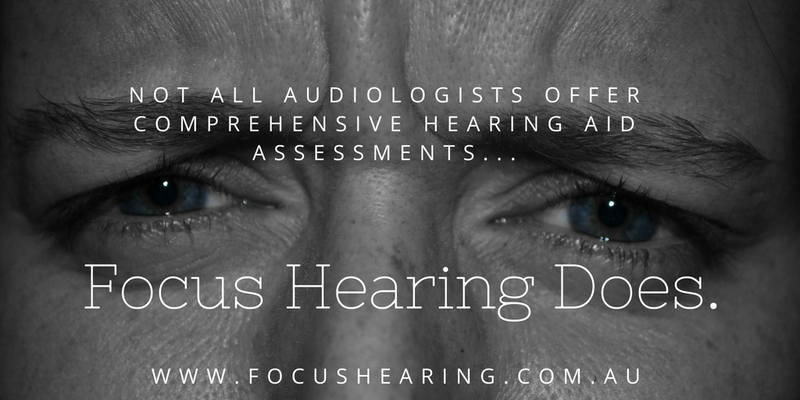 When you are treated at Focus Hearing, additional to our comprehensive Hearing Aid Assessment, you will also have a 1 hour, face-to-face consultation with one of our university trained audiologists. Therefore, you can feel confident understanding your diagnosis and your treatment options. If you would like to book in for a professional and comprehensive Hearing Aid Assessment all you have to do is call us on (02) 8402 1202 or send us an email from our website.